Golf Betting System's resident PGA Tour commentator Steve Bamford has previewed this year's Tour Championship below and his final Tour Championship tips will be published around teatime on the Tuesday before the event. Bookmark this page and come back soon! You can follow Steve on twitter @bamfordgolf. The Tour Championship by Coca-Cola, which starts on Thursday 19th December 2013, marks the close of the 2013 PGA Tour season and will see a new FedEx Cup Champion crowned. Played at the tough Donald Ross-designed East Lake, the Top 30 players across the PGA Tour season all enter the tournament with a chance of lifting the overall season Series crown and grabbing a cool $10 million first prize, on top of the $10 million tournament prize fund on offer in Atlanta. 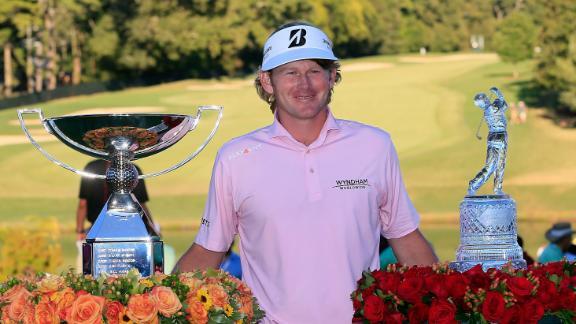 Last season 40/1 shot Brandt Snedeker delivered a win:win double by winning both the Tour Championship on a pressure packed Sunday, in turn becoming the 2012 FedEx Cup Champion. Entering East Lake Rory McIlroy was the Series leader after 2 huge wins at TPC Boston and Crooked Stick, but ultimately the close confines of East Lake and a closing 74 took him from 4th to tied 10th and saw the Northern Irishman finish as runner-up in the overall FedEx Cup. Qualification for the Tour Championship is a huge reward in itself for lower-profile players, especially young professionals, as a FedEx Cup Top 30 spot 'opens doors'. Playing East Lake means automatic invites for The Masters, U.S. Open and Open Championship. 2012 saw Ryan Moore, Carl Pettersson, Robert Garrigus, Scott Piercy, John Senden and Tour rookie John Huh all qualify for the East Lake season finale, which in turn set them fair for entry to the biggest tournaments this season. Don't miss our final Tour Championship tips which we'll publish on the Tuesday prior to the start of this season's tournament. Designer: Donald Ross 1913, Rees Jones re-design 2008; Course Type: Technical; Par: 70; Length: 7,319 yards as per the scorecard; Water Hazards: 3; Bunkers: 72; Fairways: Meyer zoyiagrass; Rough: bermudagrass 2"; Greens: 6,200 sq.ft average featuring Miniverde Bermudagrass; Stimpmeter: 12ft+; 2012 Average Score: 70.42, 20th most difficult of 49 PGA Tour courses in 2012. The winners list at East Lake since Rees Jones was summoned to make the home of the Tour Championship a far sterner examination reads like a who's-who of steady/technical golf. Camilo Villegas has always played best on tighter courses with bermudagrass carpet. The enigma that is Phil Mickelson has delivered wins at Riviera, TPC Sawgrass, TPC Four Seasons and some of you might remember his win back in July at Muirfield. Jim Furyk is the ultimate grinder, whereas Bill Haas is becoming a regular winner on sterner tests such as Riviera and Congressional. Then last year Brandt Snedeker added his name to this impressive list after previous career wins at Torrey Pines and Harbour Town. However if you'd have looked at the betting market prior to the last 4 Tour Championships you wouldn't have found any of these players near the top of the betting. Mickelson was 25/1 (yes!) after a Playoff run of 52(Liberty National)-27(TPC Boston)-30(Cog Hill). Jim Furyk was 11th in the FedEx Cup standings when he arrived in Atlanta and Bill Haas had never competed at East Lake when he came from nowhere to grab his biggest ever career win in 2011.